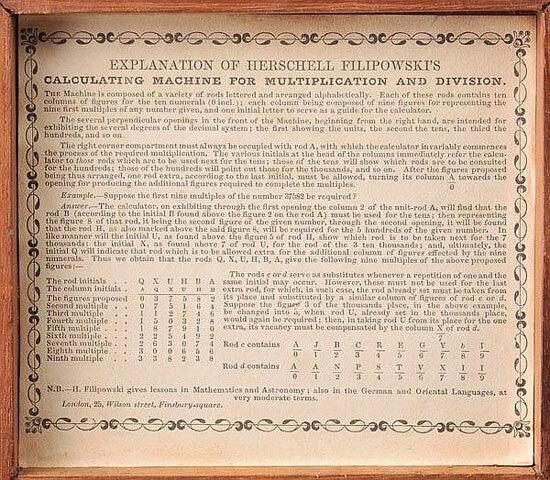 About 1860 the English mathematician, linguist, and editor Herschell Filipowski designed and published his Calculating Machine for Multiplication and Division, similar to the Napier's Bones, but actually based on the Slonimsky's theorem. It seems only 2 contrivances survived to our time (see the photos below), one at the Science Museum, London, and another in a private collection. 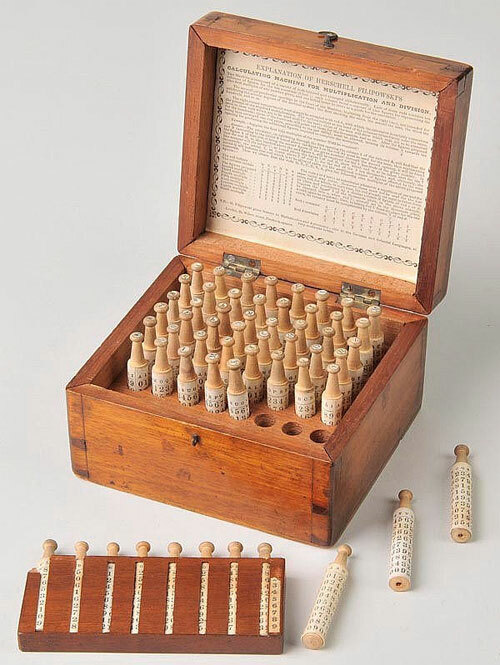 The calculating rods of Filipowski include a set of fifty-six wooden cylindrical rods, stored in holes in a wooden mahogany case with overall dimensions 128 mm x 130 mm x 75 mm. Up to 8 rods can be arranged side by side in a slim wooden tray in order to build the desired multiplication table. Each rod shows ten columns with digits and letters printed on paper and bears a knob on its top. The knob is marked with a single letter. Although Slonimsky's name isn't mentioned at all in the explanatory text, from the example it is clear, that Filipowski used Slonimsky's theorem. The only modification concerns the replacement of indices by letters. Each rod bears those ten rows of multiples, arranged as columns. A short description of the device, along with a calculating example and a table, showing the aimed result, can be found inside the lid of the box, containing his calculating rods (see the photo below). An interesting note is printed at the end of the description—H. Filipowski gives lessons in Mathematics and Astronomy; also in the German and Oriental Languages, at very moderate terms. London, 25, Wilson street, Finsbury-square. Who was the inventor of the device—Herschell Filipowski? The Jew Ẓevi Hirsch Filipowski was born in 1816 in Verzhbolovo (Вержболово), Russian Empire (now Virbalis, Lithuania). As a boy he demonstrated extraordinary endowment for mathematics and languages. When only fifteen, he published "An Almanac for One Hundred Years" both in the Polish and Russian languages. In 1839, Filipowski emigrated to London, England, and later on was followed by his wife Esther (b. 1817), and his daughter Matilda (b. 1836). In England the family had 3 more children—Denizen (b. 1847), Concezio (b. 1849) and Abraham (b. 1850). 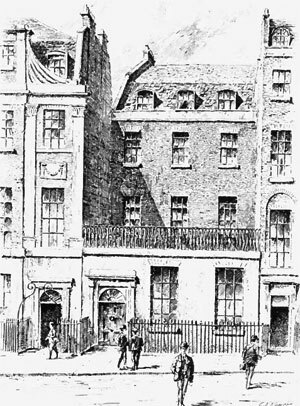 In London Filipowski was at first employed as a teacher of Hebrew and Oriental Languages in the Jews' College (a rabbinical seminary, see the nearby image), Finsbury Square, at the same time preparing himself for his future career as a mathematician and author. Later he worked as a printer and published quite a few books and edited magazines in the field of mathematics, Hebrew literature, etc. In 1849 he published a work on "Anti-Logarithms", which established his name among mathematicians. In 1850s Filipowski was employed as an actuary for the Colonial and Standard Life Offices at Edinburgh. In 1857 he translated Napier's "Canon of Logarithms" from the Latin into English, and in 1864-66 he edited Baily's "Doctrine of Life Annuities and Assurance." About 1860 Filipowski returned in London, and during this time he created the above mentioned device for multiplication. Filipowski's extensive knowledge of typography proved of great service in the publication of his works. The industrious laborer invented a font of Hebrew type, with points attached to each letter, from which a Hebrew and English Prayer-book was printed in 1862. Filipowski's linguistic powers may be judged from the assertion that he was conversant with Polish, Russian, Latin, Hebrew, Arabic, Spanish, French, English, German and Chinese. But believing that great advantages in the relations of mankind would be derived from a universal language, he urged its adoption in his various writings. Herschell Filipowski died in London, England, on 22 July, 1872.